For GIG Karasek as a Family Business counts tradition and the optimal use of knowledge of the key corporate values. We draw the profitability Potential thermal separation technology in the areas of Evaporation and distillation to the full. Für GIG Karasek als Familienunternehmen zählen Tradition und die optimale Nutzung langjährigen Wissens zu den wesentlichen Unternehmenswerten. Wir schöpfen das Wirtschaftlichkeits-Potenzial thermischer Trenntechnik in den Bereichen Eindampfung und Destillation voll aus. Where traditional methods reach their limits, the GIG Karasek Thin Film- / Short Path Technology is used: For very temperature sensitive products our proven experts develop Solutions to specific problems, tailored to your requirements and in this individual form. GIG Karasek hat sein geballtes Knowhow aus Verfahrenstechnik und Apparatebau der Entwicklung hoch spezifischer Dünnschichtverdampfer gewidmet und diese als ideale Lösungen für anspruchsvolle Aufgaben in der thermischen Trenntechnik etabliert. Debottlenecking of the evaporation system carried out under the most challenging conditions at Sappi! Sappi Ehingen attaches great importance to the optimization of processes and plants, especially measures to reduce environmental impact and increase energy efficiency. LECTURE: "Heat transfer coefficient of thin film evaporator"
CHEMCAD User Meeting - Dr. Daniel Bethge gives a lecture on "heat transfer coefficient of thin film evaporator". 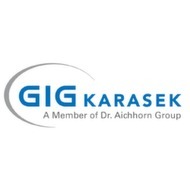 GIG Karasek is pleased to announce, to be part of Dr. Aichhorn Group. GIG Karasek reacts not only as professional equipment contractor, but also as a process technically skilled engineering partner. Columns are basic equipment for manufacturing industrial companies to separate mixtures by thermal processes. GIG Karasek has established to an international specialist to construct columns with component weights up to 120t and permissible sizes for road transport. Reliable solutions for solids-load-currents to pourable products - The Thin Film Dryer: horizontally or vertically; Depending on your requirements we manufacture the perfect dryer for your application. Complex tasks require special process Solutions - We concentrated our expertise from process Engineering and equipment development to develop highly specific Thin Film Evaporators. The perfect solution for demanding applications in thermal Separation. Expertise en masse! Get one step closer to your tailor-made process solution. Benefit from our global experience and extensive process know-how. Das Entwicklungszentrum von GIG Karasek - Optimierte, kundenspezifische Prozesslösungen in kürzester Zeit zu erarbeiten, ist das Ziel, das wir für unsere Kunden durch diese praxisnahen Versuchsanlagen erreichen. The thin-film drying technology from Gig Karasek can be used for continuous drying of suspensions, municipal sludges, slurries, pastes, wet solids, filter cakes and chemical products. Versatile and efficient drying - Thin-film dryers from GIG Karasek are a flexible, gentle and economical way to dry liquids, slurries, and pastes. If you want to catch up more on the latest developments and trends, visit us at our booth B3 booth 108. For the third time PROCESS chose the best product innovations in the industry at this year’s Powtech/TechnoPharm trade fair in Nuremberg/Germany. The judging panel selected the best entries from more than 50 nominations and presented awards in a prize-giving ceremony.